Brush your dog daily during shedding season. When your dog starts to lose his winter coat, you will probably notice hair on everything. Even short-haired breeds shed, and the hair has to go somewhere. Aggressive grooming during the spring shedding season can get that loose hair out, helping you control the hair situation. Spray your dog's coat with a conditioning spray or water. The conditioning spray can soften the coat and make it easier to comb, but even plain water is beneficial. When you comb a damp coat, the loose hairs don't fly all over when you comb them out, making cleanup easier. Remove as much loose undercoat as possible, using a coat rake. Not all dogs have an undercoat, but if your dog does, it is probably to blame for much of the loose hair floating around. 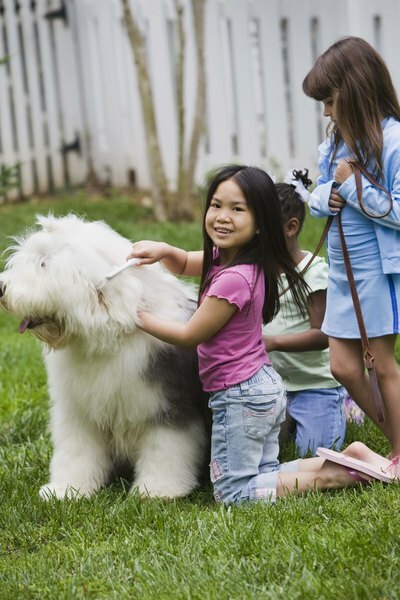 Work through your dog's coat with a brush or comb that penetrates the coat. For a short-haired dog a bristled brush may work, while a longer-coated dog, such as a collie, may require a slicker brush or metal comb. Continue to comb, even after your dog is tangle-free, as long as hair comes out. There is only so much hair for your dog to shed, and once the loose winter coat is out, the shedding will stop. Repeat the grooming process every day until you notice the shedding has stopped. For dogs who blow their coats at the end of the winter, this process takes about a week, but don't be discouraged if it takes longer. Can Climate Affect Dog Shedding? How Many Different Kinds of Coats Are There for Dogs?